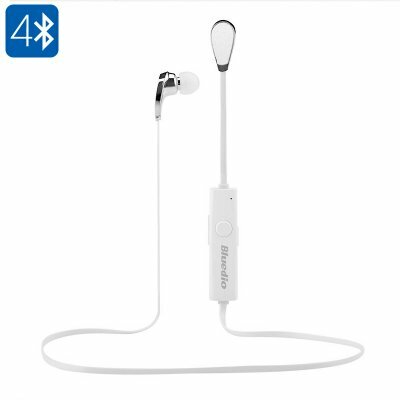 Successfully Added Bluetooth Earphones Bluedio N2 - In-Ear, Bluetooth 4.1, Multipoint Pairing, Voice Control, Sweat-Proof (White) to your Shopping Cart. These lightweight Bluetooth earphones are the N2 from Bluedio. At under 15 grams, these wireless earphones are as light as a feather so you will hardly notice you're wearing them. The t-light in-ear design and interchangeable silicon ear tips ensure a comfortable fit. These Bluetooth earphones have a 10mm dynamic driver that creates a full bodies timber with deep bass and crystal clear tones. With Bluetooth 4.1 connectivity you can sync these wireless earphones with your tablet PC, cell phone or computer and enjoy a strong wireless connectivity for up to 10 meters. With the Bluedio earphones you can enjoy music and take calls without being tethering down. So you can walk around the house or office listening to music without having to take your stereo, phone or tablet along for the ride. The audio quality of these earphones can be enjoyed without interferences thanks to their wind noise reduction that will improve audio quality and call clarity. With a on wire control the earphones make it easy to skip tracks and adjust volume. when it comes to answering calls the earphones respond to voice commands so you can pick up a call by simply saying "Yes" or "No", it couldn't be easier. If you want to listen to music from your computer or Tablet PC but don't want to miss out on any calls you will be pleased to learn of the multipoint pairing. This allows the Bluedio wireless earphones to by paired with two mobile devices simultaneously. Great for wearing around the home, at the office or during a workout these sweat-proof earphones bring the music to your ears with perfect clarity and won't cost a fortune and are one of the best earphones for the money. The Bluedio N2 wireless earphones All our products come with 12 months warranty, brought to you by the leader in electronic devices as well as wholesale headphones and earphones..
Really great! Loved it. I've been using them every day since I bought them (last summer) and just yesterday the wire was cut. I will re-buy for sure. I have bought other more expensive from local sellers that lasted less than a month.